If you’ve come across any of Leander Games’s online video slots you’ll have discovered those guys know a thing or two about making interesting games that offer the most jaded slots fan something a little different. The neat take on the fantasy-themed slot, Dragon Slot, and the fairytale expanding Wild madness of Little Pigs Strike Back showed Leander are a force to be reckoned with. 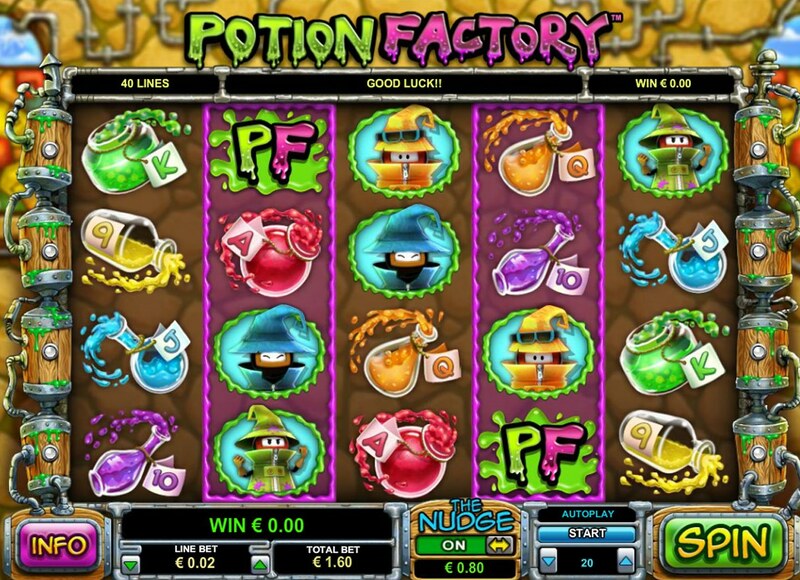 Potion Factory is another strong addition to Leander’s arsenal, and will cater perfectly to those of you who enjoy fantasy-themed slots. A 5 reel, 40 pay-line game, the slot sees you in control of three magicians – one yellow, one blue, one green – busy beavering away in their castle making magic potions. Help them make the best potions and you’ll reap the rewards. As well as the three pint-sized conjurers, the reels are taken up with multicolored potions representing the 10-through-Ace poker symbols. There’s a nice ‘Nudge’ feature – which fans of UK fruit machines will know all about – whereby you can move reels 2-4 up or down to make winning combos. You can move them by 1, 2 or 3 spaces, but the cost of using the Nudge is twice the regular bet, so it will cost you. Wild potion symbols expand, or “extend” as Leander calls them, to fill the entire reel. Three bonus Potion Cauldrons on reels 1, 3 and 5 triggers the game’s bonus feature. First you’ll get to spin a wheel to decide what you play: a Free Spins Bonus, the ‘X Formula’ Bonus game, or get an instant win. The free spins round comes in three levels, with Level 1 offering 5-8 spins, and going up to 12-15 spins for Level 3. During the round, the ‘Sticky Wild Potion’ appears on the reels and stays locked until the end of the spins. Not only that, it substitutes for all symbols. 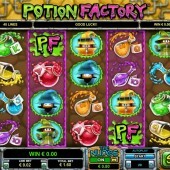 The X Formula multilevel bonus sees you having to pick the correct ingredients to make the perfect potion. Pick the wrong ingredients and your potion will do weird things to the little potion pixies. Pick correctly, however, and big prizes will be yours. With smooth animation, slick graphics and a neat twist on the tried-and-tested bonus rounds you get in all slots these days, Leander seem to have come up with another winner. Innovative slot developer Betsoft Gaming should start worrying!